Let San Diego Slip and Fall Lawyer, Mark C. Blane, Protect Your Rights After a Serious Injury. It is an unfortunate fact that San Diego slip and fall or trip and fall accidents in public areas happen all the time, such as in malls, stores, theme parks or offices. 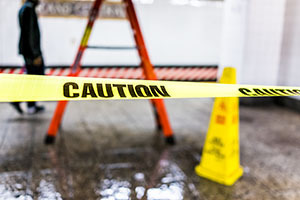 If you or a loved one has sustained serious injury from a slip and fall incident that could have been avoided were it not for the negligence or carelessness of the owner of the property or land where the accident occurred, you are entitled to legal compensation. Whether you have suffered a serious injury such as a bone fracture, head injury, sprained joint or even a spinal cord injury, your San Diego accident compensation should cover your medical costs, rehabilitation, and loss of income, disability, pain and suffering and future expenses. All this will be fiercely contested by the owner's insurance company, which will challenge the accusation of negligence, question your medical file and come up with examples of court dismissals in related cases. Before you call me on your California slip and fall injury case, you can download a FREE copy of my slip and fall legal survival book - as long as you are a California resident, or injured in a California slip and fall, trip and fall, or premise liability injury claim! It's a great book and I promise it will give you plenty of insight into your pending legal case! What is the difference between slipping and falling on government property as opposed to private property? Does this affect my injury case? Alright, what about slipping and falling on commercial property and residential property? What do I need to know? First, you need to show that the California owner or occupier of the property or area where the accident occurred is responsible for the serious injuries you suffered. should have known of the dangerous circumstances on the premises and should have corrected them in his/ her normal duties of managing the property. In many San Diego accident cases involving slip and falls, the owner's liability is not obvious. You need witnesses, pictures, detailed descriptions of the facilities and unquestionable causation links between the facility, the accident and your injuries. You may also need expert testimony. Second, your claim must be prepared in such a way that it maximizes your chances of obtaining fair compensation. This requires a thorough knowledge of medical terminology, a network of medical experts, the experience of comparative legal cases and an insider view of insurance companies' calculations and methods. San Diego slip and fall accident attorney, Mark C. Blane, is the compassionate lawyer you'll want on your side after suffering a serious injury in San Diego. Heading a legal team of approachable, competent, yet unwavering San Diego accident attorneys, Mark C. Blane will personally meet you and supervise your slip and fall case. What kinds of San Diego slip and fall injury cases have you handled? Over the years, we have seen many different types of trips, and slip and falls. But before you even contact us to schedule your no-cost consultation, request to receive a copy of our California personal injury claims guide,The Top 10 Secrets You Need To Know About Your Injury Claim, BEFORE You Call A Lawyer at no cost. Remember there are no fees for our legal services until we win your case, so call us today at 619-813-7955. Hablamos Español.